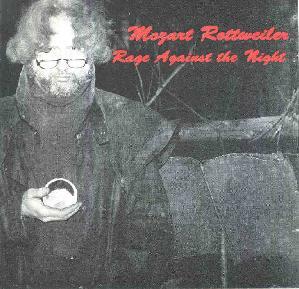 Mozart Rottweiler - "Rage Against The Night"
Mozart Rottweiler has apparently been around for a while. The promo material states that in the early 70's he played behinds such 50's acts as Bo Didley, the 5 Satins, and The Belmonts, and has opened for Buzzy Lynhart and the Mahavishnu Orchestra. Mozart's current band is a trio consisting of himself on bass, keyboards, and horseless guitar (? ), Vincent Guagenti (aka Silver Screen) on guitar, bass, and digital bag of tricks, and Charlie Randazzo (aka Dazzler) on drums. The basis of the music is a grungy, garagey blues rock style. But there's lots of oddball stuff here that indicates Mozart has a variety of interests. As he says in his promo sheet, "The music if it must have a label could be called Alternative-gothic rusty metal or dark blues. But I just call it good rock and roll with some psycho-baroque embellishments". I'll go with that. "Night Is In Black And White" is a blues rocker with a ZZ Top "La Grange" backbone to it. "Johnny B. Bach" is Mozart's take on the Chuck Berry classic. "Got My Lights And My Heart On For You" is a honky tonkin' country bar rocker. And "Castles And Dragons" took me a bit by surprise going off into heavy prog rock territory. I hear a variety of influences from Nektar to Uriah Heep. It's that majestic but metallic style that isn't terribly complex but does make an attempt at themes and movements, and includes, as the title suggests, fantasy lyrics. Overall, I think Mozart Rottweiler would be a rousing good time as a bar band, and I suspect there is far more to his career than can be summarized on one CD. A good fun set of tunes. For more information and sound samples you can visit the Mozart Rottweiler web site. Contact via snail mail c/o Mozart Rottweiler; PO Box 137; Centuc Station; Yonkers, NY 10710.